I stumbled across weeSpring after I had my first baby last October. I really wish I had discovered the site before she was born. weeSpring is a platform that helps you share advice with your friends about baby essentials, like bottles, strollers, and diapers. You can compare products within a single category, like high chairs, or browse a trusted friend's favorites. 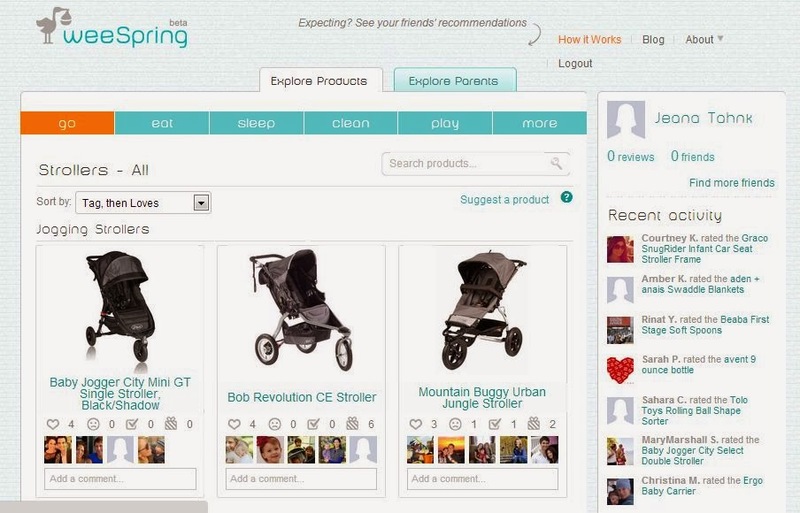 Expecting parents use weeSpring to ask their friends about the things they couldn't live without, and find out what they wish they'd never bought. New parents use weeSpring to pass along their own tried-and-true advice, while continuing to learn from their friends. Tonight, we sent an email out to all weeSpring users who have rated a Graco car seat, because the National Highway Traffic Safety Administration issued a recall of 3.8 million child seats -- and they’re currently disputing whether there should be a mandatory recall of Graco’s infant seats as well. It's a bigger deal than the usual recall announcement, because it’s the largest in five years. So while we don't usually email en masse about recalls, we decided this was worth sharing with the broader weeSpring community, because there's a pretty good chance that you or someone you know is using a Graco car seat. Just another good reason to be on weeSpring. I'm really impressed with their site, customer service and care so far - I will definitely be using weeSpring to manage any future product purchases for my daughter, and to keep track of "maybe baby #2" products too! Do you have any online tools that you would recommend to help out new parents? * I am in no way affiliated with weeSpring (they have no clue I even exist in this world). I just thought it was a really great idea for new parents and wanted to share! "you need to have more fun with motherhood"